Mercedes and Ferrari have gone with very different tyre strategies for next weekend’s Singapore Grand Prix. 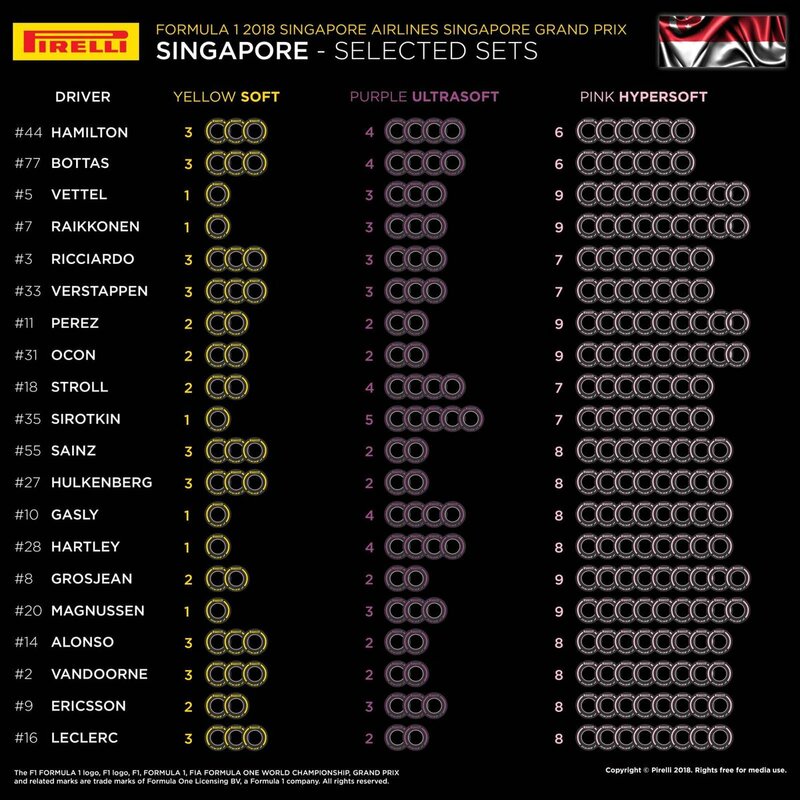 Formula 1 tyre supplier Pirelli has revealed the selected sets for the 15th race of the 2018 season, with the softs, ultrasofts and hypersofts in use at the Marina Bay Street Circuit this year. Mercedes will have fewer sets of the pink-striped hypers than any other team on the grid, opting to bring just six sets of the softest compound. Most others have gone for seven or eight sets, but Ferrari, Force India and Haas all have nine sets. 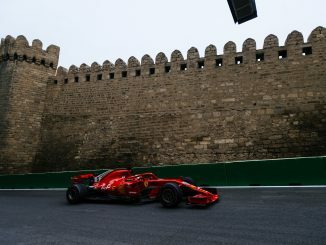 Ferrari seem confident the two softer compounds will be the best for this race, electing to have just one set of softs for Kimi Raikkonen and Sebastian Vettel. Mercedes are taking a more cautious approach, with three sets of softs and four ultras. 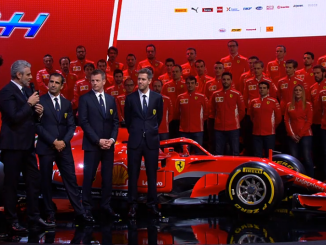 Red Bull are going with a similar selection to Mercedes, taking one more lot of hypers instead of ultras. Sergey Sirotkin will have more sets of the purple-striped tyre than any other driver. Williams have selected only one set of softs for the Russian, but he’ll have five ultras for the weekend, while his teammate Lance Stroll has an extra set of softs. 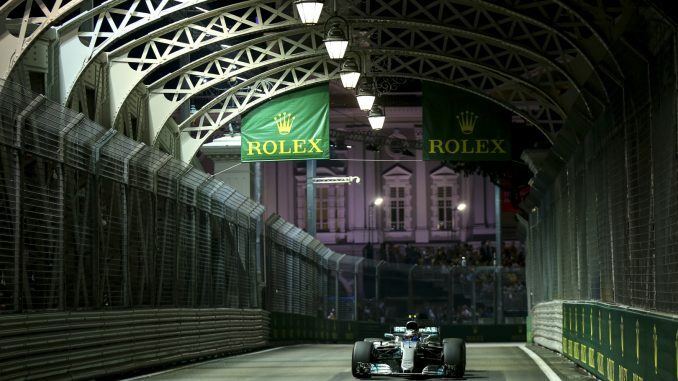 The majority of drivers will be able to use two or three sets of ultras over the course of the Singapore race weekend, but Toro Rosso joins Mercedes and Williams with an extra set of the middle compound. 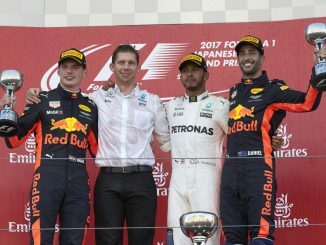 Most teams have given both drivers the same number of each of the three compounds, but Williams, Haas and Sauber have each split their strategies. With Pirelli bringing non-consecutive compounds to this event, Charles Leclerc, Romain Grosjean and Stroll will each have one more set of softs and fewer ultras than their teammates, but the same number of hypers. The compounds are different to those used at last year’s race, when the supersofts were used alongside the soft and hypersoft.